Aside from Christmas, I'm really looking forward to December 17th this year. 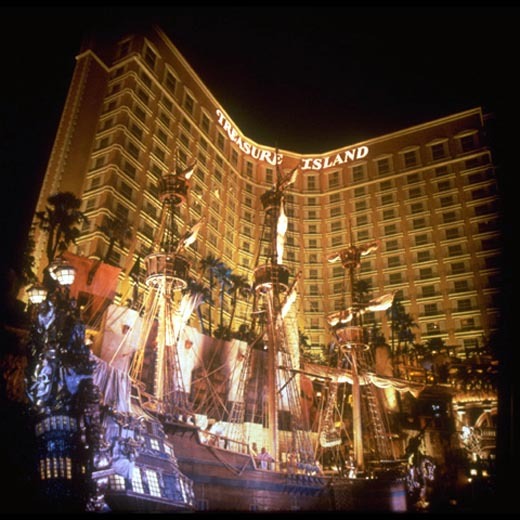 I booked a room at Treasure Island in Las Vegas in celebration of the boyfriend's birthday. Said boyfriend is turning 29 on December 30th, but instead of battling out New Years on the strip (something we have done twice now), I decided to give him his present a little early this time. I'm so excited! We used to go to Vegas often because we had a friend that lived there. Now that friend lives down the street from us, so we don't have anymore excuses to go visit. Of course in typical Noelle -OCD madness, I'm already planning out my clothes. I ordered a dress from Forever21.com and it has already apparently sold out because I can't find it on the site! It is a white, jacquard dress that has cap sleeves and is more of a sheath style. I think I may have to get it tailored a bit because it is large in the chest area. December can be chilly in Vegas, so I do plan on wearing little jackets during the day while we walk around. We stayed at Treasure Island about two years ago for a friend's wedding and we fell in love with our room! 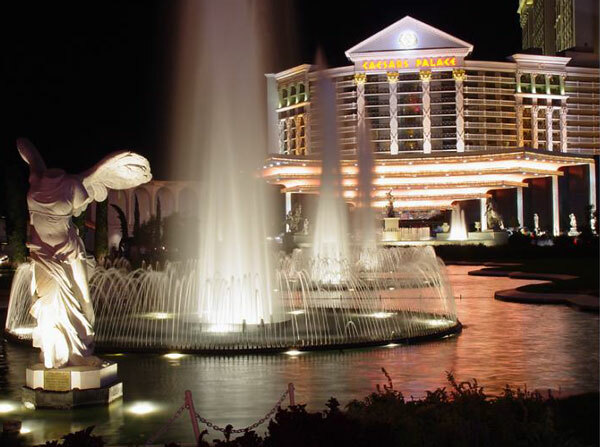 I love visiting Ceasar's Palace. The shopping! I want to splurge on something while I'm there. Does anyone have any fun Vegas recommendations? Any must-do shopping? We will be there Friday through Sunday so I'm hoping we can get a lot in. I absolutely LOVE Vegas! So lucky you're going. Honestly, it may be one of my favorite places in the whole world. So funny your bf's b-day is the 30th, mine's the 31st! woot woot! :) New Year's is a crappy time to have a birthday I think, haha. But yay for you--TI is fun, I love their cheesy little Kahunaville bar/restaurant. I've always had so much fun there for some reason (pre-gaming). I could give you a huge list of recs, but I'm sure we both probably like the same places, haha. Are you seeing a show? Andi: THANK YOU for such a sweet and thoughtful comment Andi! Haha, I remember vaguely that cheesy little bar. I think I might have had a few drinks there before the wedding we attended ;) We aren't going to see a show, mainly because I am footing a lot of the bill (I mean, it IS his birthday!) so I think going out for dinner and drinks is more on the menu ;) But I definitely want to be a tourist, see the usual sights, and go shopping. This so inspired me to go to Vegas this December ... I've only been once but LOVED it. I just came back on Sunday from Vegas. I stayed in TI, and love it too! I completely recommend you go to City Center, it is amazing! The shops and the building are to die for. The buffet at TI is also very good, and their new pizzeria is good too. LAVO restaurant at the Palazzo is excellent too, great music and ambience. Kim: It's like Disneyland, but for adults! So fun. This is probably nothing you don't already know but I'd recommend going to the Fashion show mall (right beside TI) and of course the shops at Planet Hollywood. The outlet mall (Las Vegas premium oulets) is great too! I wouldn't recommend leaving the strip to go shopping (other than the outlets) because I really don't think it's worth the time/energy. I made that mistake when I was there in January of this year. I have never stayed at Treasure Island and every time I have been in Vegas I've wanted to see the pirate show but it's too windy. I just don't think it's in the cards for me! Sounds so fun!!! I have never been but it's on my list of must visits! PS. I LOVE the shoes you posted about. . . gorge! I know you and the bf will have a blast! I say check out all of the Mirage..I love that hotel! Kayla: Aww, hopefully one day! It does get windy in Vegas. Not good! Emily: Thanks sweetie =) I would love to do a blogger meet up! I can only imagine how much trouble we would get into! Andee: Yeah, it does run big! The pitfalls of ordering online ;( I wonder mow much tailoring will cost...hope it works out and is worth it! It's been a long time since I took something to my tailor. Oh my God, your boyfriend and mine share the same birthday! I am currently having that dilemma on what to do. I love Las Vegas, we stayed at the penthouse of the Planet Hollywood. It was unbelievable, front row seats by our bed of the Bellagio fountains!